Downtown Auckland is one big construction site these days with City Rail Link and the Commercial Bay development in full swing. As interesting as the construction is, even more interesting is what we’ll get at the completion of it all. 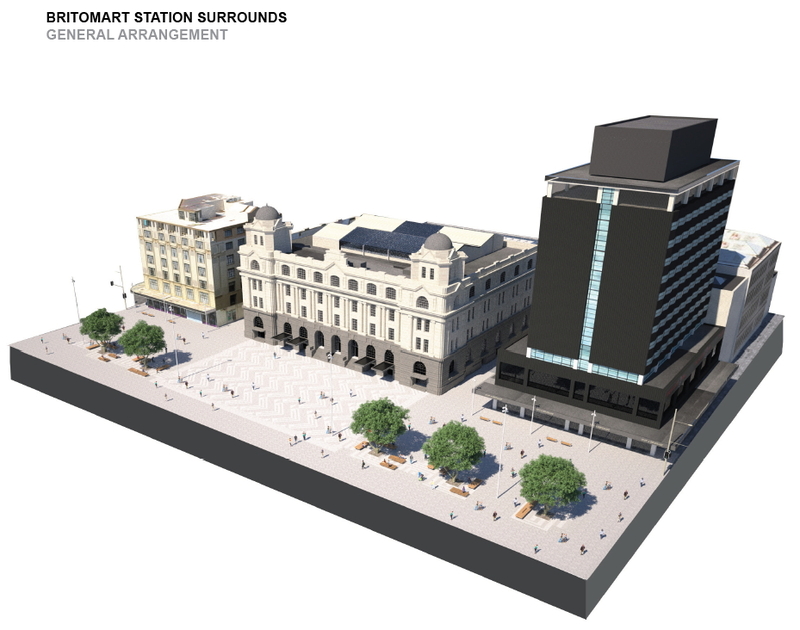 Recently, City Rail Link Ltd, the organisation now delivering the CRL, released the concept design for the new plaza that will be built on Lower Queen St, between Customs and Quay streets. The City Rail Link Design team in conjunction with Auckland Council has been working on the design for Lower Queen Street and Britomart station surrounds for when the CRL work there is completed. 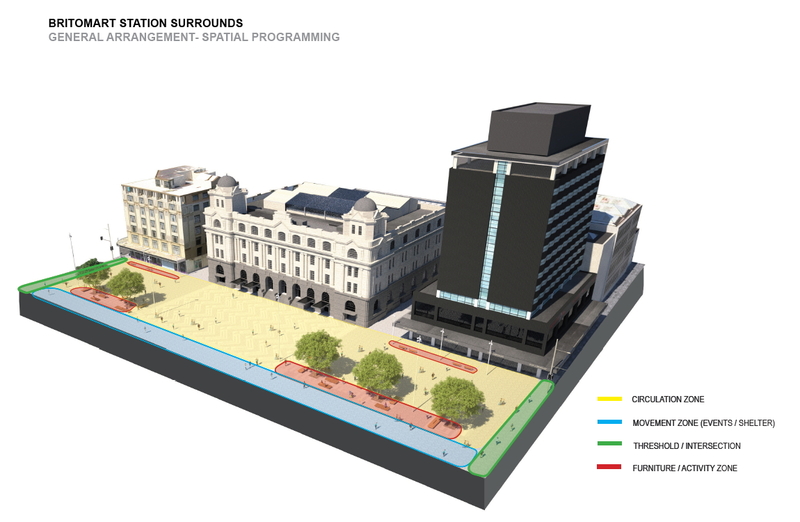 The concept design has just been completed for review by the Auckland Urban Design Panel and the City Centre Advisory Board. 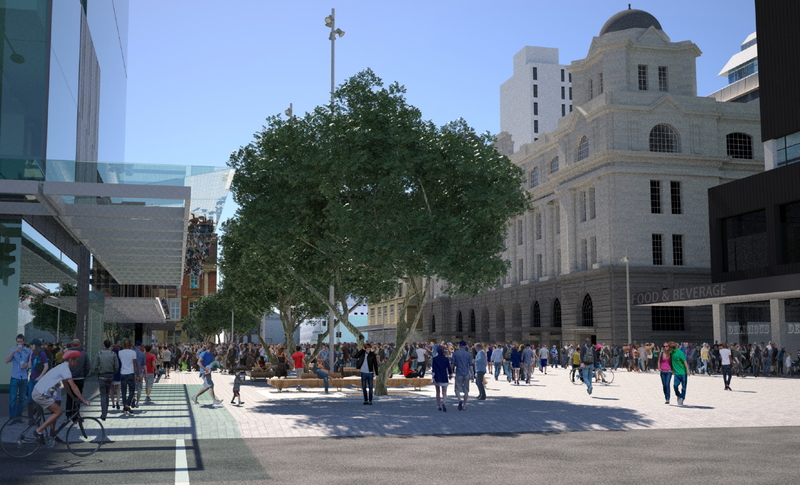 What’s proposed is a creation of a stunning plaza and pedestrian space for Auckland in Lower Queen Street outside the Britomart Transport Centre. The team is working in partnership with Mana Whenua to generate a high quality flexible space that responds to the unique Auckland narrative. A 67-page document steps though many of the elements that have factored into the design. Factors such as the land use, heritage buildings, pedestrian and vehicle movement, cultural integration and more. This also includes some of the plans for surrounding areas, which will see substantial improvement with most of the downtown area turned over to pedestrians. Some of this we saw as part of the Council’s updated vision for the city centre. 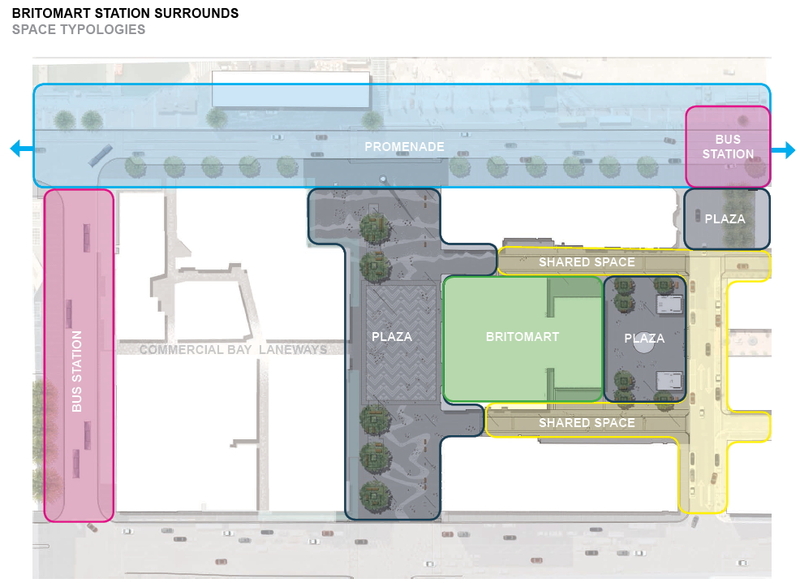 Notably in here, the current temporary Britomart entrance becomes a plaza, as does the short section of Commerce St between Tyler St and Quay St while all other the roads within the Britomart area become shared spaces. 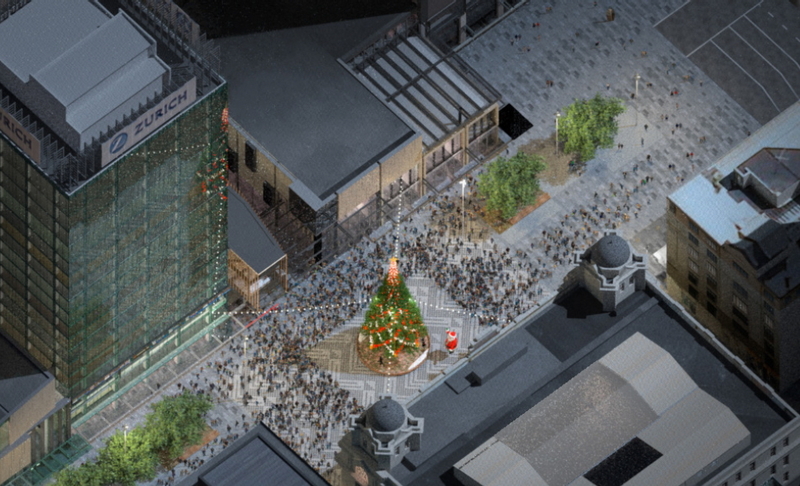 Here’s the design for Lower Queen St. It uses paving to split the space up into three areas. At the southern end, paving represents the Waihorotiu Stream that flows under Queen St while the paving at the northern end represents the old foreshore. These are separated by an Ātea (on a Marae it is a “courtyard, public forum – open area in front of the wharenui where formal welcomes to visitors takes place and issues are debated“). The Paving design does seem a nice touch, I just hope it will be obvious what it represents is from ground level. And some closer views. The numbers are the same as the ones above. Lastly, here are a few suggestions for how this new space could be used for events. The CRL works in this area and the final layout of the plaza is likely to be completed in around 2019-20. I like it. It’s tempting to clutter this sort of public space up with stuff, but given it’s critical movement function having mostly open space and hard paving makes sense. I do wonder if in addition to the trees some removable slender poles that could support shade cloth could be a good addition to provide more shade in summer. I find that the trees planted along Lambton Quay in WLG have been made into canopy types with lots of shading…However I am uncertain of the species of it, I know it’s a dedicious however. If there was enough space I wouldn’t mind seeing one or two open air cafes. Might work. Brisbane has similar on a pedestrianized main street. Isnt there an open air cafe there RIGHT NOW (opposite Ferry Terminal)? And before the area was closed for construction, there was at least one more cafe that provided open air seating outside the small existing skyscraper (Zurich House). Yes, I know but I was commenting because the artist’s renditions don’t seem to indicate any. Will be a great place to sit and people-watch over a coffee/wine/beer. Weather permitting. Design concept ‘Maori soldier figure’: http://www.nzmuseums.co.nz/account/3648/object/28909. Suggests the level of historical engagement is typically superficial. The original plans said “Dude in cloak”. That’ll be the return of the original sculpture that used t stand in the centre of traffic here, some 40 years ago. Big fella, big cloak, small head. Yes. As an immigrant I had to look up ‘Mana whenua” and it said refers to the mana held by local people who have ‘demonstrated authority’ over land or territory in a particular area, authority which is derived through whakapapa links to that area. My initial reaction was a rather negative ‘do Maori have skilled town planners’ but then I realised everyone can legitimately have input to design of public space. Then a concern about the meaning of ‘partnership’ – we normally use that word to mean a collaboration between equals and I wondered if both sides in this partnership are bringing the same effort and finances to the party and to what extent one side can veto the other. I had just started to contemplate what Maori traditional use could contribute since this area which was tidal until European settlement and reclamation or even if we could blame Maori for the rather undistinguished area it has been for the last decade. 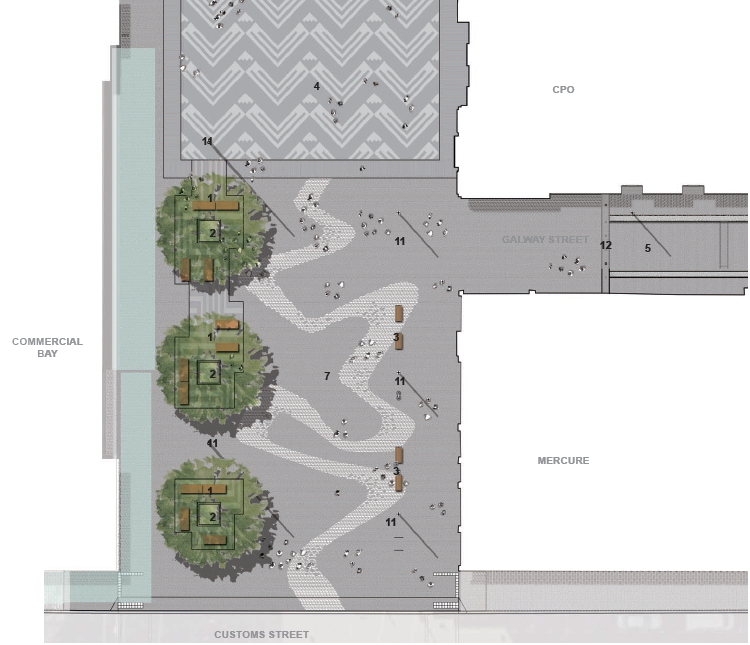 Then I read on and in typical council speak it says “flexible space that responds to the unique Auckland narrative” and “stunning plaza and pedestrian space” and I shifted my unworthy negative feelings off Maori and on to the Councils PR spin unit. ‘Stunning’ in context doesn’t mean piles of comatose pedestrians but it does indicate memorable and worthy of comment as per Trafalgar square, Red square, Piazza San Marco, Champs-Élysées. This is perfectly OK but not stunning. This plaza is the centre of the centre and Auckland’s and NZ’s doorstep for many tourists so it does deserve serious expenditure to get it right. The pictures give a good impression most importantly being an actual improvement (mainly achieved by removing all vehicles). I am delighted to see non-native trees back in fashion. They appear to be slighly dwarfed London Plane trees (as per Victoria park and Wenderholm) and a deciduous tree is suitable with light in winter and shade in summer so long as the council responds to the leaves in Autumn. NZ native trees are fantastic but using them in a concrete jungle is like keeping white doves in a cage. I do hope a spokesman for the Maori involvement in this design will contribute a post or an article clarifying the extent of their authority in Council decisions both officially and effectively and the ways they have made modern Auckland better for all of us. I see real value in continuity and tradition otherwise Auckland will just become a multi-cultural hodgepodge with no soul of its own. Its literally peripheral, but I am really worried about how all these plans seem to assume the Quay St Cycleway is gone. Which map do you mean? Also, I have heard that yes, some consider it a cycle axis, but feel the best way for cyclists would be to create wide shared spaces in front of the Ferry Terminal. Exactly what we have been pushing against for ages (I even used this exact location as an example years back), and it would be a big step backwards from what is there now. So, what happens to the buses that currently / were planned to turn left out of Galway and right out of Tyler ? Are they completely axed and no more? They’re just going to stay out on Quay St doing big U-turns? Tyler and Galway are no place for diesel buses. The driver floors it, the noise reverberates and poor pedestrians nearly die of fright. There was a post on this recently, it involves a bus ballsack and Quay St. Honestly, I’m not making this up and trying to get you to google questionable activities! Awesome. Now we just need that same design as a PT mall from Customs all the way down to Victoria. 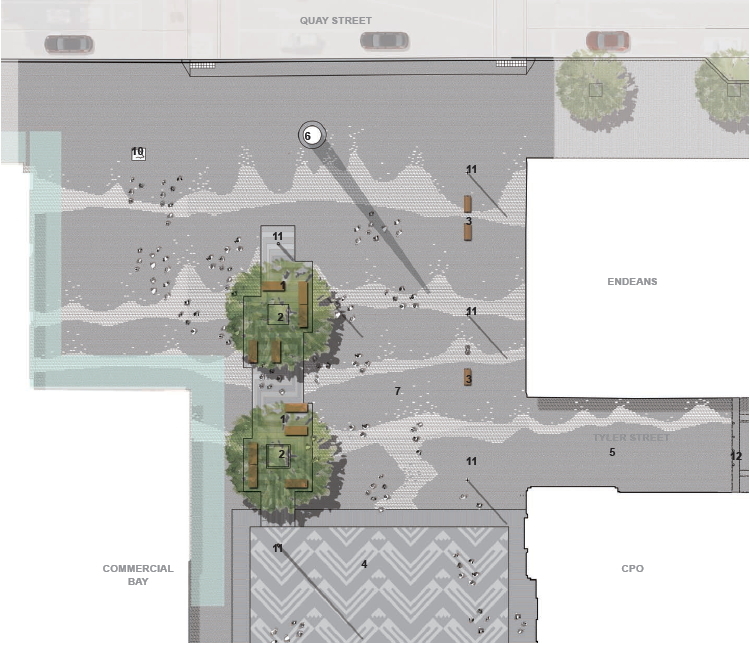 Cut off Fort and Shortland Streets and turn those areas into plazas too. Would be an amazing space that would be heaving with people everyday once the CRL is pumping them out. We might just have ourselves a real, live city. Not a big fan of convenants as it is basically us telling future generations how to do things. Another generation might have a quite legitimate reason to move a tree and be planning on planting five others nearby. They might. Certainly we ‘move’ trees because we let people design as if they don’t matter. Trees are like children – you never quite know how they will turn out but on balance care and attention is beneficial. Moving a tree is like adopting a teenager. I prefer to see a small sapling planted and then live long enough to watch it grow to maturity. The entire concept and curse of modern design is once a generation it says lets rip up what went before and start again. Fortunately NZ has many towns and city suburbs in decline so lovely examples of fish and chip shops from the seventies and four square supermarkets from the eighties are there to be seen by the discerning. Woops, meant to say remove not move! I think removing trees on public land should be a last resort, however covenants mean anyone with the money to enforce it can stop everyone else from doing something even if it has widespread support. If not covenant, then how about some regulations to restrict what Council and AT are doing at present? No we have gone past full circle, we are on at least the second revolution. Come to think of it why don’t they bring the Wind Tree sculpture back? It was designed to go in this wind tunnel. Just think what size the trees would be now. There are a few differences now however, the red fence is open with access to the waterfront, britomart is now a major train station, they’re building a couple skyscrapers nearby, quay st is now a major walking and cycling axis through to the viaduct and wynyard. So sure fulll circle on design, but with perhaps ten times more people around. True. 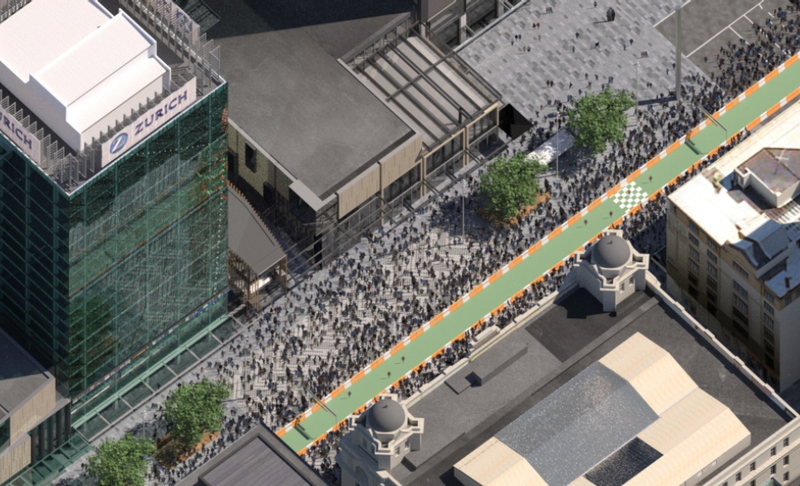 And the big flaw in this design is not pedestrianising Quay St. So next time we come full circle I hope that will be the improvement. I really miss those fountains. Watching a gust of wind spray water on unsuspecting pedestrians was a highlight of my infrequent trips to town back in the day. Come to Wellington ! The Bucket Fountain does that every day in Cuba St. ! The space will be flawed if it is made as grey as the shared spaces: their greyness is a big drag. Use bricks or sandstone or other non-grey materials, at least in sections. I disagree, I think the subtlety is an asset. It lets the people, shops, activity, trees and furniture enliven the space. Paving it too bold would feel cluttered and dated very quickly. Yes and there’s way too much focus on refreshing pavement surfaces – both here and overseas. A design in which the trees, art and people create the interest and beauty should still look good as the surfaces age. They can’t. The larger the surface area, the greyer and drabber (not subtle, it is about as far from understated as you can get) it becomes and the more the other features of the space has to work against it. I am not suggest bold paving. I am suggesting something other than industrial wasteland. Post some pictures of ideas. I’d like more greenery. The image posted above by greenwelly is an excellent cautionary tale regarding using bricks and more earthy sandstone colours. Heidi – you are right about greenery / vegetation. How about using the skills of that supreme genius who is responsible for the regular plantings in the temperate Wintergarden? Now I expect ‘stunning’ and usually it delivers although I have never repeated my first visit where I was close to swooning in the scent of the orchids. How they produce snapdragons that are so sturdy you could use to beat a villian in to submission is a mystery. Miraculous hanging baskets. Returning to the matter at hand the use of window boxes containing fuchsia and geraniums similar to municipal Bavaria would be welcome and suitable in our climate. However it does need a adequate ongoing investment. Interesting study going on at present to see if planter boxes in a suburban town centre improves air quality. I’d always try to have plants in the ground though. Window boxes and planter boxes are just so much harder to maintain… How about Poor Knight’s Lilies, appropriate toetoe species, hebes that flower in winter, and if it was part of a raingarden there are some ‘stunning’ ephemeral swamp plants… the plant designers for public spaces are doing some nice work. They just need some space allocated to it. Please none of those horrible dated red brick pavements. Looks so old and horrible, and they are a pain to clean. Keeping it simple makes it easy to update the space regularly and easily with street furniture, keeping it looking fresh and hip for longer. I like the current bluestone/grey pavers for this reason alone. Do we have no space for statues nowadays? Or how about something for people without a war fetish? Maybe a mother nursing a toddler? Or a skateboarder? I’d love to see the statue of the unknown property developer. +1, If we are going to have statues for war they should at least be a memorial to the unnamed teenager forced to die for empire. Why? Regardless of any individual valour they may (may not) have demonstrated, their impact on the course of human history was limited. We shouldn’t build a statue of Albert Speer either. Why? Because war is many things at once. Valour and freedom. Waste of human potential. Failure of leaders to use diplomacy. Lack of appropriate restrictions on weapons manufacture. And above all, sad, sad sorrow. To the boys forced to die for the stupidity of others, and to the mothers who bore, raised and wept forever over them, the words valour and freedom are cold, heartless lies. Yet the impact of human history upon them was enormous, tragic, and wasteful. I am not suggesting a statue in their honour, but rather as an apology for what we did to them. I would like to see a statue of Douglas Haig – so we could spit on him as we walk past. With perhaps a hoiho sitting on its back and a Hector’s dolphin coming out of the water near its feet. But the title should be “The Last Chance”. There is actually a lifesize moa statue on lower Albert Street, it’s gorgeous. If we get cars out of there we might be able to enjoy it. Replace them with mowers? Street Legal of course. Moving the buses from Tyler and Galway is still the wrong choice….. I consider the paving representing the Waihorotiu Stream to be a placemarker for when they actually daylight the stream. Daylighting the stream would be lovely. A massive undertaking though, and would need to start on the other end of Queen Street Valley (or we’d get a fake drinking-water-fed water feature). Not sure it’s the best idea as it’s pretty much entirely a concrete catchment, which means water runs straight off it. It would likely be an empty stream bed most of the time and a torrent carrying every bit of rubbish and debris with it whenever it rains. The oppprtunity is huge though. All that water from pavement is going into the harbour. If it isn’t good enough for a stream, it isn’t good enough for the harbour. An ephemeral stream with some primary runoff treatment, appropriate plants and regular maintenance would be amazing and educational. And of course a massive undertaking. Not entirely true, currently a lot of rubbish gets picked up by street-sweeper trucks before it ever makes it into the drain. A stream would be a lot harder to clean in this fashion. In every decent rain we would get a much dirtier plume of water in the harbour than we do now. Also, the only time the stream could be enjoyed would be when it is raining and immediately after, a time when the streets are often at their emptiest. Trapping the rubbish is a design parameter. The stream can be designed to collect no runoff except through one of many filters. Any additional rubbish blown there can be hand-collected. “In every decent rain we would get a much dirtier plume of water in the harbour than we do now.” You’re thinking rubbish. (See above). I’m thinking chemical pollutants. The quality of the water entering a harbour is directly related to the speed with which it is directed there. “Slow it, spread it, sink it”. “Also, the only time the stream could be enjoyed would be when it is raining and immediately after” … I’m not sure what level of baseflow there would be, but it doesn’t bother me – the dynamic nature of ephemeral streams is beautiful in itself. This isn’t a drain, it is a slowing, filtering waterway. So the flow of new rainfall from top to bottom should take more than minutes – several hours to a few days. True, it could be poorly designed and polluted as a result, in which case it is well-situated to be an emblem of how we treat our waterways. Now that is a marvellous idea Heidi. I would love to see Ligar Canal opened up again. We wouldn’t need rubbish bins or sewers, everything could just go right in. It would an improvement over the current plan. All in all, it looks promising. 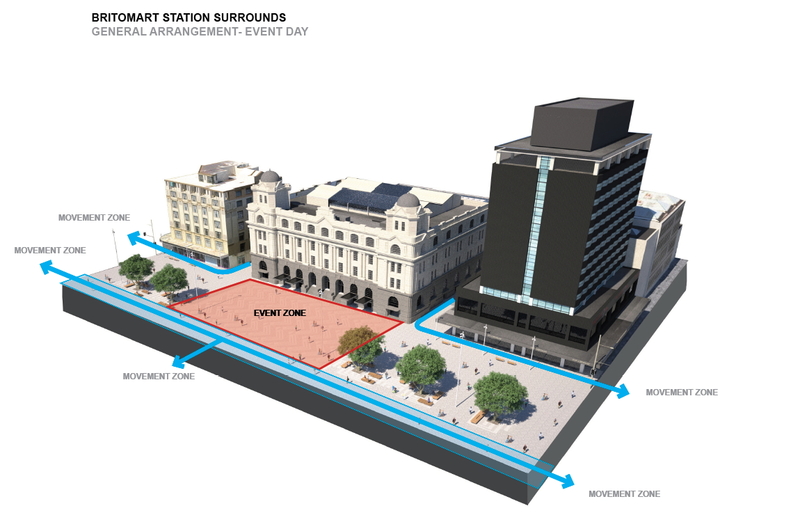 I especially liked the idea of having it act as an event space – Aotea Square _may_ be more popular in that respect post-CRL, however with our engagement with the waterfront I expect that Britomart would still win out. Kinda like a smaller version of the Rockefeller Plaza. I guess this mean any future Cooper and Co developments are pretty much dead and buried. The area for their future building looks to be replaced by a new plaza (unless i’m mistaken). I thought the Cooper proposals actually looked pretty good. You are kind of mistaken. Copper & Co proposed a building where you temporary entrance is now but that’s land opened by council. Was a cheeky play to try and get more land from the public. However, they do have plans for an eventual new building, similar to the EY/Westpac building, in the space currently occupied by those single storey shops in the middle of Britomart. Pretty sure that was a cheeky bid at some sort of unilateral land swap development proposal. Unless that bit of Britomart was designed to have a building on top to start with it’s hard to see it every being an economic proposition. These public space plans are all based on the misguided concept that people want to stand around in large groups doing nothing. This is already the worst part of Queen Street, it was the worst part of Queen Street when it was a pedestrianised square and looking at the designs it will remain the worst part of Queen Street well into the future. Just turning it back into a street with some shops either side would be a huge improvement. Most people will be moving through here, rather than loitering around. 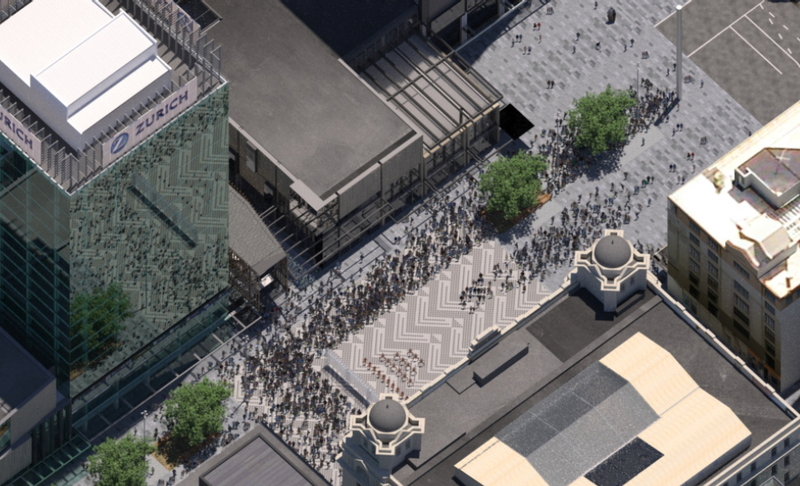 Britomart is much busier than it has ever been, which will only increase once the CRL is done. Greater ferry usage. New Commercial Bay development and people going to/from Wynyard Quarter. Its just not the same part of the city it was when it was last pedestrianised. Better get down to Freyberg Square quickly Miffy, since it reopened there are scores of wrong people wronging around in the square. You’d better set them straight. I saw a good description of the Freyberg Place project. It was described using the German word Verschlimmbesserung which means to make things worse. Bernie did often make things worse for the Krauts! German is good like that, you can construct a word for anything. I think the best word to describe Freyburg place is Beliebtesonnigenmittagessenessenplatz. 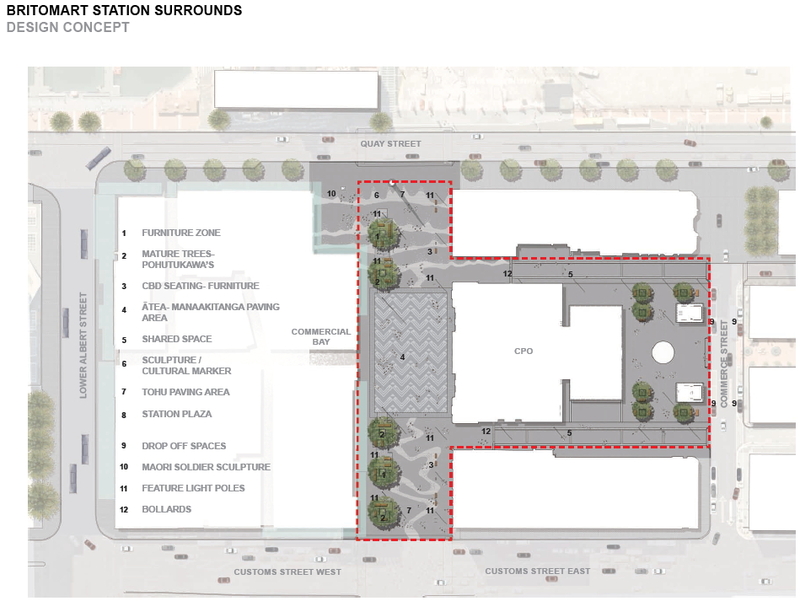 I actually think all of this looks quite uninteresting and yet another space(s) that will compete with the rather under utilised Aotea square people gathering precinct. I wonder that encouraging people intensive gatherings just at a major transport outlet is not going to encourage people congested space inhibiting those wanting to use the Britomart station. Is there not the best opportunity here to have the lower Q area and surrounds for a city centre proper bus station and perhaps have some advanced planning for either a trenched or overhead terminal/mode transfer LR hub right at Britomart? Is there any way to provide cover for pedestrians from the rain between the britomart main entrance and queen street? It appears at the moment you’d get soaking wet leaving britomart? Or trying to cross the plaza. Sensible. And going from an eastern bus stop to a western one? Maybe we need Bob’s wintergarden idea? Maybe a clever streamesque cover that causes rippled effect on floor below to recreate the stream. Well, there WAS a underground link from Britomart to Zurich, but that got demolished when they dug out the new tracks. Did anyone think of keeping / replacing the link? It seems not. On the CRL website there’s a video which implies that the underpass is going to be re-instated, but I can’t find any more definitive sources that clarify the matter. I’d personally be in favour of rebuilding the underpass (with an entrance from one of the Commercial Bay laneways) as it would be very useful in wet weather or if there was a major event blocking the square. No the decision was made to not reinstate the underpass. The concept was that once the bus interchange had been moved and vehicles largely excluded, then the surface would be a public and pedestrian space, and there would be no need for underground passages for people. To design the surface to be open and accessible for people is a great idea, although I do worry about the weather…. I keep on thinking “fountain”. Big, impressive, fountain…. I’m not happy with the big trees blocking the view up Queen St and down to the Ferry building. 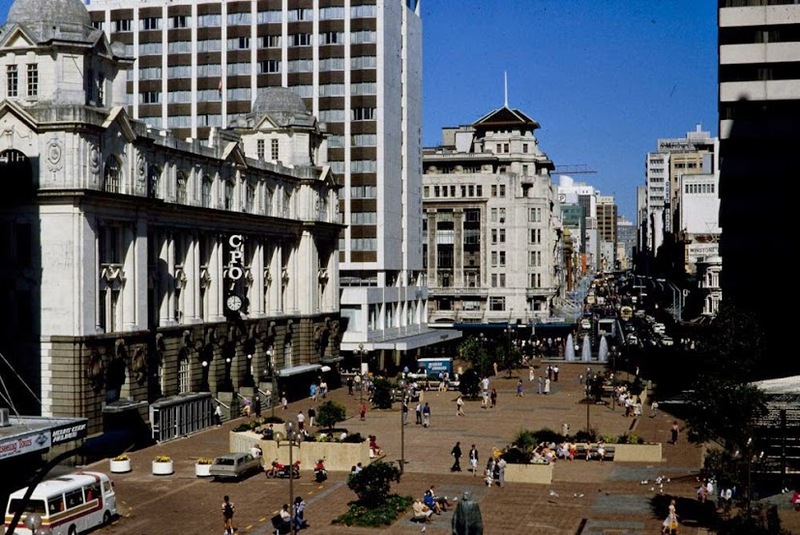 A square needs to be related to its surroundings, and Auckland is badly missing any kind of Vista. I had heard that the first versions had Queen St straight all the way to Karangahape Rd. The story goes that someone thought a kink would provide interest, but of course, it just obscured the view of the sea from all along its length. Anyone else heard this story and know if it’s true? Te Ara has this plan as the original plan for Auckland: https://teara.govt.nz/en/zoomify/22900/original-plan-for-auckland which doesn’t look much like Auckland. That link was awesome! I especially loved the spelling of Pitt St (Pyt) and measuring in chains. That one is a fascinating bit of history. It was originally Fore St because it literally ran along the foreshore. However once the continued land reclamation moved the foreshore several blocks further north, the street began to be more associated with the nearby military barracks on the top of the hill… so over time Fore became Fort in the public mind, and eventually they made it official. Thanks Nick, I had wondered exactly this. And classic “Reserved for a Church and for the general use of the Natives”. What about some protection from rain, a bit like Wellington does? Especially when waiting to cross the road to the ferry, pour Customs st or exiting buildings. Auckland doesn’t always have great weather, especially at the end of a winter’s day. Yes, rain is an issue with making any shelter design less appealing to look at on our screens, not as nice on those beautiful sunny days etc & is perhaps hard to match to historical buildings. I know currently going along Custom St to the far Eastern bus starting area in rain is no fun. Is future activity space can be used for food trucks? The space needs something for people to stay there, maybe a couple of cafes, kids zones? This isn’t 1992. With the CRL open there will be more people than you want there. Also don’t forget that the whole west side will be the new shops and lanes of the Commercial Bay development, while the CPO building is being re-jigged for a better arrangment of shops and cafes. Combine that with the existing shop fronts of the Endeans and Mercure buildings and it will have those cafes and shops up pretty much all of both sides. Compare to the 90s when the west side was the blank facade of an inward facing mall, and the east side was a boarded up old post office. It seems as though there is now no opportunity to bring the bus stations together or to provide covered connections between the modes. Did our submissions on that not get looked at? How far along are these concepts? It’s not always sunny in that area and the further apart the stations are the less conducive to interchange there will be. You must remember these places are design by people with half an alphebet behind their names that know nothing what the average Joe in the street wants . And the only time they will go near the place is when they open to the poor public . Alphabet people also designed Takutai Sq, which in my opinion functions quite well (with the exception being no cover from the weather). Incidentally, if you disagree that Takutai Sq works quite well, that simply goes to show that we all have different desires for a given location, or use the location differently… I do agree that we need some furnishings, however we should see how folks use the square first – Wouldn’t want people to be crowded out by the amenities. As an older person who uses a walking stick i would prefer the buses were able to be closer together or overlapping and handy to Britomart. It’s nice to have good usable spaces but we also need the Public transport system to be convenient and user friendly. I’m sure that both things are compatible however not in the present layout. I’m glad you’ve written this, and I hope they listen eventually. How does this work with the proposed Queen Street tramway? Will this square have to be dug up again for this? Or will the tram not be running down infront of the Britomart Transport Centre to Quay Street anymore? No tram stop in front of the Britomart train station? In other pictures I have seen trams on Queen St. Where do they go if not straight ahead to the ferry building and then turn right to Mission Bay? They turn left at Customs Street and head towards Wynyard Quarter and eventually the North Shore. I was one of the people involved in putting deckchairs out in this space for four months in 2015/16 and want to offer some insight into how people used this space and how it could be framed up. Residents would come and bring their own coffee and a book and read for a couple of hours, tourists would sit (guiltfree and not having to buy anything) and wait for their bus, train, ferry, cruise ship, locals would meet on the grass, some bought takeaways and sat in the sun, others brought their own food, mothers breastfed, kids played, artists installed art projects, buskers performed and people flowed through the space the entire time. People want unmediated public realm, that they can shape to their own use, can sit without feeling out of place (unlike a mall), they want shade, shelter and to not get wet. They want access to toilets, they want to know where to go (bus, train, lockers), they want to know what’s going on in Auckland. Our temporary solution was humble but everyday I had people come and be amazed at this piece of work. That they could sit somewhere and not feel the need to move on, that the chairs were just left for them to use (and only three went missing, people from the rough sleeping community nominated themselves kaitiaki for the chairs). I think our focus for this space should be on manaakitanga. Thanks, Margaret, I’ll copy that and take to my placemaking group, as we’re hoping to do a similar pocket park idea in the corner of a carpark.